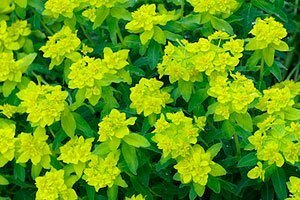 Cushion Spurge or Euphorbia polychroma is one of my favorite spring perennials. It blooms so long that we enjoy its bright chrome yellow flowers for weeks. To get technical, the flowers are actually bracts or modified leaves, which is why they last so long. The plant’s common name comes from its cushion-like, dome-shaped growth habit. This is a great spring perennial, which is quite drought-tolerant and cold hardy for USDA Zones 4 to 8. If happy, it will self-seed, so it can become a good groundcover plant. We often dig up seedlings and either move them elsewhere in the garden, or pot them up and grow them on for the following year. 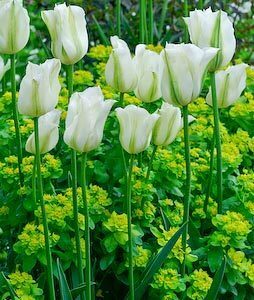 Some people consider this plant a garden thug because of its self-seeding tendency, but I find it’s easy to control, either by weeding out unwanted seedlings or clipping the plant back by a third after it has flowered. In any case, it is not one of those truly invasive plants that spreads by roots and becomes impossible to get rid of. 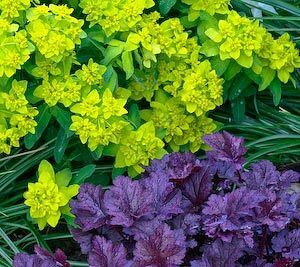 I have planted Euphorbia polychroma in full sun at the edges of garden beds and paired it with ‘Spring Green’ tulips and purple-leaved Heuchera, as shown here and below. Light: In zones 4 to 5, it does very well in full sun. But in hotter, more southern regions, you’re better off to plant it in part shade – a spot with morning sun and afternoon shade is ideal. Soil: This perennial does well in average, well-drained soil, and grows 12 to 15 inches tall and about two feet wide. Cutting back: Cut the plants back by about a third after flowering is finished. Doing this will also curb self-seeding. This helps plants stay compact and prevents them from falling apart in the center, which mature plants have a tendency to do in mid-summer. Just be careful to wear gloves when you’re handling the plant – it has white sap that can irritate your skin. Of course, most gardeners ignore botanical names, and go with cushion spurge. © flower-gardening-made-easy.com. All rights reserved.